Patch Tuesday is the name given to the day each month that Microsoft releases security and other patches for their operating systems and other software. 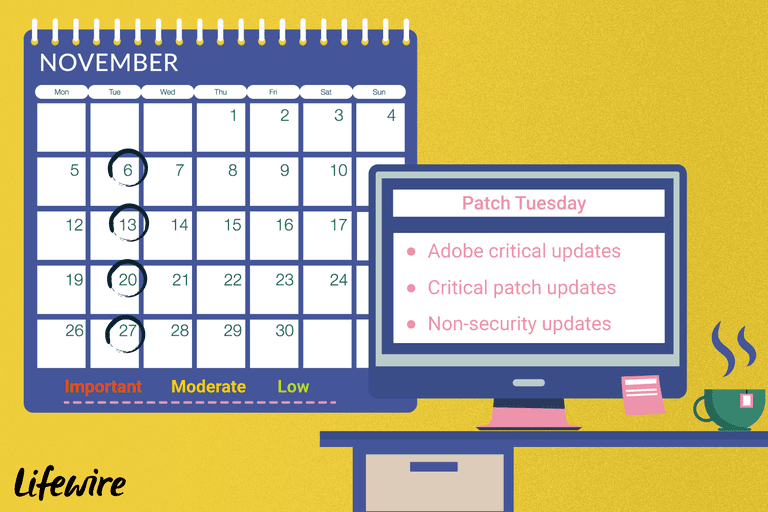 Patch Tuesday is always the second Tuesday of each month and more recently is being referred to as Update Tuesday. Non-security updates to Microsoft Office tend to occur on the first Tuesday of each month and firmware updates for Microsoft's Surface devices on the third Tuesday of every month. Most Windows users will experience more of a Patch Wednesday because they're prompted to install, or notice the installation of, the updates downloaded via Windows Update on Tuesday night or Wednesday morning. Some half-jokingly refer to the day after Patch Tuesday as Crash Wednesday, referring to the troubles that sometimes accompany a computer after the patches are installed (honestly, this rarely happens). The latest Patch Tuesday was on April 9, 2019 and consisted of 34 individual security updates, correcting 75 unique issues across Microsoft Windows operating systems and some other Microsoft software. The next Patch Tuesday will be on May 14, 2019. If you're currently using Windows 8.1 but have not yet applied the Windows 8.1 Update package or updated to Windows 10, you must do so to continue to receive these important security patches! See our Windows 8.1 Update piece for more on what this is and how to upgrade or How to Download Windows 10 for more on that upgrade. What Do These Patch Tuesday Updates Do? These patches from Microsoft update several individual files involved in making Windows and other Microsoft software work. These files were determined by Microsoft to have security issues, meaning that they have "bugs" that could provide a means to do something malicious to your computer without your knowledge. How Do I Know If I Need These Security Updates? You need these updates if you're running any supported edition of Microsoft's operating systems, 32-bit or 64-bit. This includes Windows 10, Windows 8 (as well as Windows 8.1), and Windows 7, plus supported Server versions of Windows. A number of other products are receiving patches this month too. You can see the full list on Microsoft's Security Update Guide page, along with the associated KB articles and security vulnerability details. Just set the date filter from 4/9/2019 to 4/9/2019 to avoid showing previous months' updates. See Microsoft Security Bulletin Severity Rating System for more on these classifications and the April 2019 Security Updates Release Notes for Microsoft's very brief summary on this collection of security updates. Windows XP and Windows Vista are no longer supported by Microsoft and so no longer receive security patches. Windows Vista support ended on April 11, 2017 and Windows XP support ended on April 8, 2014. In case you're curious: Windows 7 support ends on January 14, 2020 and Windows 8 support ends on January 10, 2023. Windows 10 support is slated to end on October 14, 2025, but expect that to be extended as future iterations of Windows 10 are released. Are There Any Non-Security Updates This Patch Tuesday? Yes, a number of non-security updates are being made available for all supported versions of Windows including, as usual, this month's update to the Windows Malicious Software Removal Tool. Microsoft's Surface tablets also usually get driver and/or firmware updates on Patch Tuesday. You can get all the details on these updates from Microsoft's Surface Update History page. Individual update histories are available for of Microsoft's Surface devices. There may also be non-security updates included this month for Microsoft software other than Windows. See the non-security update information in the section below for details. In most situations, the best way to download patches on Patch Tuesday is via Windows Update. Only the updates you need will be listed and, unless you've configured Windows Update otherwise, will be downloaded and installed automatically. See How Do I Install Windows Updates? if you're new to this or need some help. You can usually find links to any non-security Microsoft Office updates on the Microsoft Office Updates blog. Updates are typically not available to consumers for individual installation. When they are, or if you're a business or enterprise user, please know that most of these downloads come in a choice of 32-bit or 64-bit versions. See Do I Have 32-bit or 64-bit Windows? if you're not sure which downloads to choose. While updates from Microsoft rarely result in widespread problems with Windows itself, they do frequently cause specific issues with software or drivers provided by other companies. If you haven't yet installed these patches, please see How to Prevent Windows Updates From Crashing Your PC for a number of preventative measures you should take before applying these updates, including disabling fully automatic updates. See How to Recover From a Frozen Windows Update Installation for help if your computer freezes during the installation of an update. See How to Fix Problems Caused by Windows Updates for help undoing the damage if the updates already installed but you're now experiencing a problem. See Windows Updates & Patch Tuesday FAQ for answers to other common questions, including "Does Microsoft test these updates before they push them out?" and "Why hasn't Microsoft fixed the problem that their update caused on my computer?!" Microsoft has publicly commented that beginning with Windows 10, they will no longer be pushing updates solely on Patch Tuesday, instead pushing them more frequently, essentially ending the idea of Patch Tuesday altogether. While this change goes for both security updates and non-security updates, and Microsoft is clearly updating Windows 10 outside of Patch Tuesday, so far they still seem to be pushing a majority of the updates to their latest operating system on Patch Tuesday.